The Xbox One that you snag on November 22nd (or thereafter) does some pretty neat stuff besides just playing video games: live TV, NFL fantasy league and voice commands for everything. But that's all bigger-picture stuff. Some of the coolest things that the Xbox One does are in the details, many of which were just revealed this week in a press preview of the upcoming game console. For instance, did you know that the console's OneGuide feature does more than just show you what's available to watch over cable? In fact, you can customize the guide to the point where individual SkyDrive folders appear as "channels," easily selectable among your regularly scheduled programming. And that's just one of several fascinating abilities we witnessed this week. Media Center's gone. For real. But all is not lost! Any videos you've got on your Windows 8 (or 8.1) PC will stream to the Xbox One using the Xbox Video application. "On Windows 8, I just go to devices, play and that's the Xbox right there. And you can see that it's switched me to Xbox Video, and in just a second it'll sync up the video and play it off the PC," Microsoft Senior Director of Product Management Albert Penello told us this week while demonstrating the feature. The same setup applies to music files on your PC managed by Xbox Music -- simply send it to the Xbox One from your PC and the console auto-loads Xbox Music and starts playing. Not quite as fully featured as Media Center, but not too shabby a trade-off either. Sadly, it will not play MP3s stored locally at launch (only streamed). Penello said that won't be permanent. And yes, that also includes videos: Penello jumped into his SkyDrive account -- which featured images of the A-Team van replica he's building, as well as a '68 GTO he's working on -- to show off Larry "Major Nelson" Hryb's Xbox One unboxing video. "This was the original HD video of Larry's Xbox One unboxing that I have on SkyDrive. This is not local on the box; this is being transcoded by SkyDrive and brought down to the box," Penello said as he guided us through the demo. He also noted that every Xbox account comes with a free 7GB of SkyDrive space, making this process that much easier. 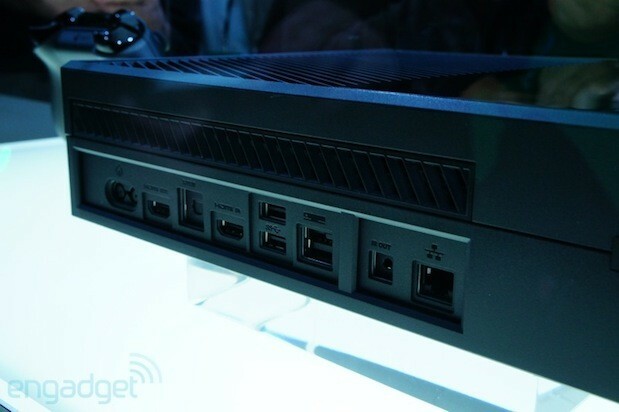 You already knew that your cable box plugs right into the back of the Xbox One via HDMI-in, but did you know that literally any other HDMI device can also go in that slot? "There's always gonna be a little bit of lag. And so the problem with going out and promoting that feature is that it's a total 'your mileage may vary' thing," Penello told us. That said, if you can deal with the (nigh imperceptible) bit of lag, anything from your Apple TV to your Xbox 360 could be plugged right in and played through the Xbox One. At the very least, it frees up an extra HDMI port, right? Your friend Barry is a real jerk. He can't sit still for even a minute! Thankfully, during the 45-minute conference call you're having with him, the Kinect's camera will sense Barry's movement and follow him wherever he goes. Well, unless he leaves the room completely. Then you've got other issues. The picture can also expand to account for more participants, or it can contract to focus in on fewer people. It's a somewhat creepy effect while in use, but certainly a useful one for maintaining eye contact during video calls. You've cut the cord. We did too. Isn't it delightful? 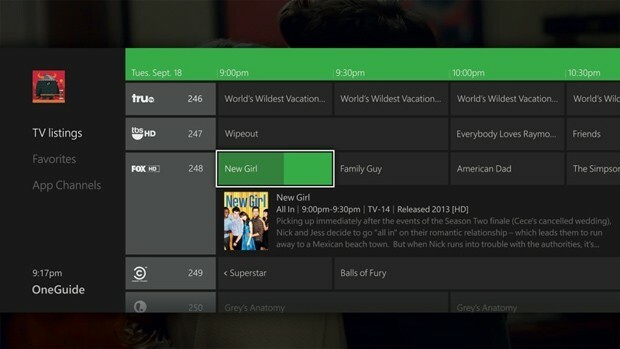 Sadly, we cord-cutters don't have much use for Xbox One's TV programming tool OneGuide. Or have we spoken too soon? We have, as the OneGuide does more than just show what's on your cable box -- it also enables "app channels" so that you can browse Hulu, Netflix or even SkyDrive content. They're customizable as well, meaning you could dedicate a SkyDrive channel just to, say, images of the '68 GTO you're rebuilding. Or the entire Simpsons library. Oooh, an all-Simpsons channel!